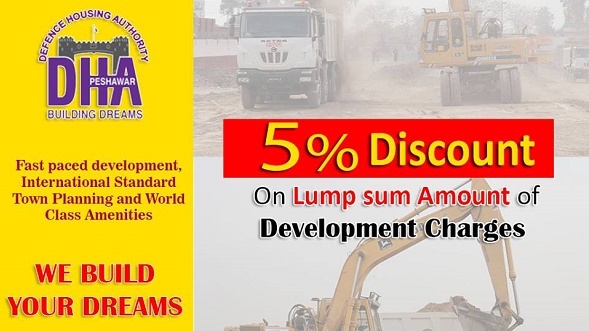 New Town is a government's housing scheme in Gwadar which appeals to a large number of potential investors looking to buy residential or commercial plots for future investment. The public notice clearly states that new town directorate will not take any responsibility of such files which do not exist on the approved masterplan of the society. It doesn't recognize many files which are being sold in the market in the name of New Town Housing Scheme. 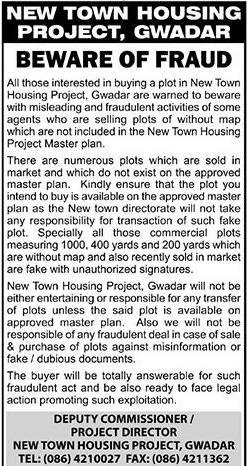 Especially commercial plot files of 1000 sqy, 400 sqy and 200 sqy which are without map and which recently sold in the market are fake and with unauthorized signatures.New Town Gwadar shall not entertain any such files and will not be responsible for any sale purchase against fake/dubious documents. The management of New Town Housing Scheme Gwadar holds buyers of such files responsible and answerable for such fraudulent act and warns them to be ready to face legal action promoting such exploitation.